Transportation Office must have a completed Transportation Request from the campus. Bus service will start as soon as possible after the Transportation Office receives the paperwork. The driver will call with a time of pick up or drop off and the day service will start. If there is a change in a child’s delivery place, served by the same bus, the bus driver must have a note signed by the parent/guardian and/or approved by the campus administrator before the student can be loaded at the campus. Students, if eligible for bus service, will ride the bus with the rest of the elementary students and be picked up at the regular bus stop with other students. A bus driver will call with the scheduled time they will deliver your student from school as soon as they develop a route plan. Students riding the midday bus home will be delivered as close as possible to home. 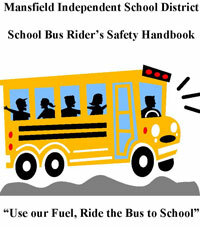 The bus driver must see a parent/guardian or adult before letting the student off the bus. If no parent/guardian is seen the student will remain on the bus until completion of this bus run. The student will then be returned to the campus. If this happens more than one time, it could result in the student not being able to ride the bus. The bus driver will call parent/guardian when route time changes occur due to new students added to their route. A bus driver will call with the scheduled time they will pick up your student as soon as they develop a route plan. Midday buses will pick students up at a designated bus stop as close as possible to their home. If the bus comes by two consecutive days and the student doesn’t ride, the bus driver will make an attempt to determine the student’s status. Unless otherwise coordinated, the bus will not be back until the parent/guardian calls the Transportation Dispatch to make new arrangements. Students should be waiting for the bus. If eligible to ride a bus, the half-day afternoon student will ride the regular bus home with other elementary students and will be dropped off at the regular bus stop closest to their home. If not eligible (i.e., living in the walk zone) there will be no transportation provided.